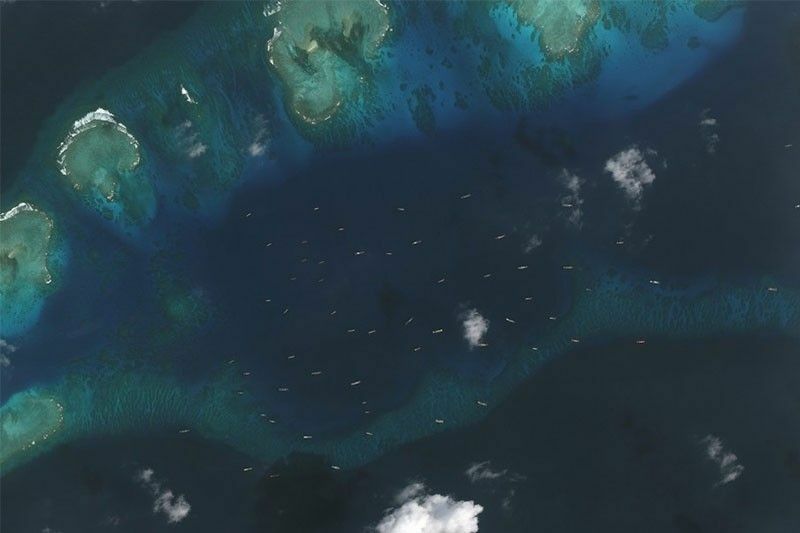 Satellite imagery from Dec. 20, 2018 shows Chinese vessels near Pag-Asa Island in the West Philippine Sea. "I understand that we already issued a diplomatic protest per the (Armed Forces of the Philippines) Western Command," Panelo said in a press briefing Monday. "'Yung total daw ng 600 hindi naman pala totoo 'yun kasi ang basis ng monitoring ng Western Command 'yung bow. 'Yun 'yung part ng ship ang binibilang nila ang total pala 275 lang," Panelo said. He added the vessels were not "encircling" the island, but are just there. In an interview with CNN Philippines' "New Day," Brig. Gen. Edgard Arevalo, AFP spokesperson, confirmed the presence of Chinese vessels around Pag-asa Island. "What's happening is they remain stationary in the area. Some come and go, that's why it's quite inaccurate to report the number because some of them come and go. Although some of them stay for a few days or weeks," Arevalo said. In February, Washington-based Asia Maritime Transparency Intitiative reported that China deployed vessels near Pag-asa Asa Island in response to the Philippine government's efforts to rehabilitate its facilities on the island.